1. Preheat oven to 400 degrees. Heat cast iron skillet to medium heat and melt cooking fat. Cook onion, pepper and mushroom until soft, about 3-5 minutes. Add in clove of garlic. 2. Turn heat to medium low and add in 1/4 jar of tomato sauce. Stir with veggies. 3. Salt and pepper the chicken breasts and add them to the pan. Spoon more tomato sauce on top. Sprinkle oregano over the entire dish. 4. Place entire pan in oven for 20 minutes or until the chicken breasts are cooked through. 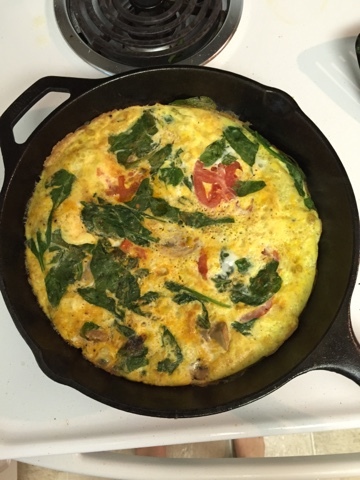 6:45 am Half of a spinach, mushroom and tomato frittata from the Whole30 cookbook. 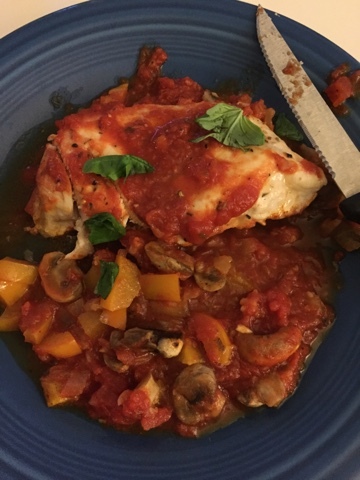 8:15pm Italian Chicken. Basically like a Chicken Parmesan sans parmesan and breadcrumbs. Today was fine. I'm definitely happy to be on the home stretch. Less than a week until I try legumes again! Also starting the reintroduction process with legumes is probably the most underwhelming thing I can think of. I'm sure its because its something that most people don't have issues with, but I'm still not an avid legumes fan. And what fun is hummus if I still can't have pita? Anyways, I ate the yummy frittata. I had it again for lunch and for some reason around 3pm I started having stomach issues. I didn't feel nauseous or anything, just the gurgles. Not sure why. I had a haircut at six and normally I would've had some sort of snack to tide me over until dinner, but since my stomach was iffy, I didn't have anything. This caused me to be REALLY hungry for dinner, but it took less than 30 minutes so that was good. I didn't get enough sleep last night so I didn't have as much of the Tiger Blood feeling as yesterday. Lately I've struggled falling asleep which is weird for me. 6 more days!